• Add that unique tone to your Fender, Gibson, electric guitar tube amp or speaker crossover. The bag(s) appear to bear a 9-15-72 date stamp. 18 mm x 10 mm. Buy without worry! Each cap is marked. 01 uf 20% 400v, but will test between. 015 uf and. 025 uf, generally in the. 018-.022 range. In a guitar they'll see around half a volt and will work well. I tested the capitors on my Peak LCR 45, the capacitor tested at.02579 uf (25.79 nF) see picture 7 results may vary per tester. The capacitor was parted from a 1950's Wurlitzer model 4400 model tube organwatch the video the organ sounded excellent. YOU GET ALL 4 OF THESE. I HAVE NO WAY TO FULLY TEST THEM BUT THEY WERE IN A WORKING DEVICE AND I DO SHOW A CONTINUITY TEST ON EACH ONE. THEY ARE SOLD AS IS DUE TO THE NATURE OF OLD ELECTRONICS. These are polypropylene and revered in a lot of Audio applications. Guitar and Tube amplification projects. Type: axial lead electrolytic capacitor. Values: 250 uF 50VDC each. Tested At 50VDC. SOLD AS-IS = UNTESTED . There are more available-ASK. These are NOS and there is a variety of them. 10% tolerance. The sound is nice and articulate, smooth and creamy. This capacitor provides excellent sonic characteristics. "It takes the original components to recreate that classic tone.". • Add that unique tone to your Fender, Gibson, electric guitar tube amp or speaker crossover. BOX LOT Vintage Radio / TV Circuit Boards, Capacitors, etc. This lot contains various values of Sprague, Orange Drop, Allen Bradley, & Bumble Bee capacitors and resistors. The capacitors are standard values for guitar amplifier modification or repair. They have probably all wandered a little. Short shaft with slot. Price is per capacitor. They are used, untested, sold as-is. There are varying length leads. The values may have wandered a little as they often do with age. These are mylar not paper in oil capacitors. 12 - 1500uF. 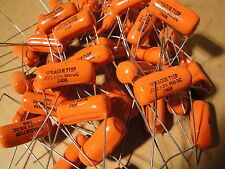 356 Capacitors in total with the. -10/50 Tolerance. 12 - 1000uF. 24 - 680uF. MCap EVO Oil. PAIR New Mundorf 10 uF EVO Aluminum-Oil Cap. Excellent for use in high quality tube electronics and speaker crossovers. NOS and never been used. About Tone Man Guitar: I have been playing the guitar for over 50 years. My passion has always been about the Tone.033uf bridge. 015uf neck. My own personal favorite tone cap combination. The Humbucker Blues Tone Pair. Values test ok. Power tested on a Heathkit IT-28 and they're good after reforming (due to age). I have over thirty. The K40Y-9 are high quality PIO capacitors made for Russian military. The conductor is made of aluminum foil and the dielectric is oil saturated paper. These capacitors are ideal for the neck position Humbucker. Sprague Atom 25uF 50V Aluminum Electrolytic Capacitor. TVA - 1306. Sprague Atoms are a nice high quality electrolytic cap. Just a word of caution. You should not get inside your amp. It's best to take it to a qualified tech if you are unsure. • Add that unique tone to your Fender, Gibson, electric guitar tube amp or speaker crossover. "It takes the original components to recreate that classic tone.". One vintage 0.01 mfd 600VDC tropicalized oil filled porcelain capacitor. Tested as in photo. I will test each one I ship. I am happy to combine shipping with other items. 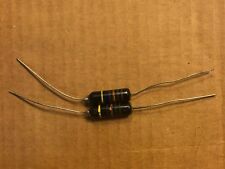 One NOS Cornell Dubilier 40 uF 450 Vdc Audio Filter Electrolytic Capacitor. Type: Beaver. • Add that unique tone to your Fender, Gibson, electric guitar tube amp or speaker crossover. "It takes the original components to recreate that classic tone. It is marked. 022 uf 400v, but will have drifted upwards a bit over the years, probably around. 025-.028 uf. There are so few of these still around, and when they're gone, they're gone. The K40N-2's are high quality capacitors made for military. These capacitors provide excellent sonic characteristics, with a high tolerance in a wide temperature range. These are comparable in construction and performance to the Russian K40Y-9's, and slightly less expensive. Type: paper wax. "It takes the original components to recreate that classic tone.". • Add that unique tone to your Fender, Gibson, electric guitar tube amp or speaker crossover. 16pcs NOS PHILIPS 042 100uF 160V HI END CAPS FOR HI-END TUBE AUDIO! 2pcs Capacitor Clamp Holder 2" / 51mm. Capacitor Filter Bare PCB Support 48pcs D18mm Electrolytic Capacitors. 20pcs Capacitor Clamp Holder 3" / 76mm. 2pcs Capacitor Clamp Holder 3" / 76mm. 20x 470uf/35v Rubycon YXF Electrolytic Capacitor Long Life Low Impedance. 10x 470uf/50v Rubycon YXF Electrolytic Capacitor Long Life Low Impedance. 20x 100uf/50v Rubycon YXF Electrolytic Capacitor Long Life Low Impedance.